Air Georgian’s SOAR program for aviation career awareness, recruitment and retention continues to grow with the addition of Transwest. The partnership provides a career pathway for Transwest pilots to join Air Georgian with an entry into the Air Canada network. SOAR is designed to provide partnered operators and flight schools with predictable, timed attrition with extended notice periods while providing their employees visibility regarding career progression with an entry point to the Air Canada system. All Air Georgian pilots are guaranteed an interview with Air Canada through a PMA. Up to 40% of Air Georgian pilots will advance to Air Canada in 2018, providing the fastest path for pilots to Air Canada. Proudly building upon a 60-year heritage of aviation excellence and employing a diverse fleet of fixed wing aircraft on wheels, skies and floats; Transwest Air continues to be the largest scheduled, charter and medevac aviation operation in Saskatchewan. Air Georgian is the longest serving regional partner of the Air Canada family, operating 64,000 regional flights per year on behalf of Air Canada. With bases in Calgary and Toronto, they carry close to 2 million passengers a year to 31 domestic and transborder destinations. 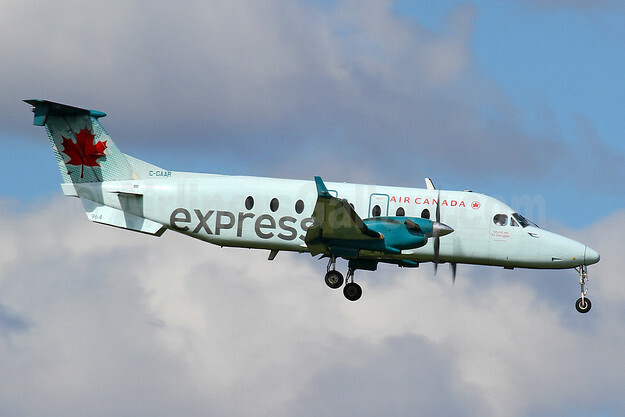 Copyright Photo: Air Canada Express-Air Georgian Beech (Raytheon) 1900D C-GAAR (msn UE-207) YYZ (Keith Burton). Image: 912875. This entry was posted in Air Georgian, Transwest Air and tagged Air Canada Express-Air Georgian, Air Georgian, Beech (Raytheon) 1900D, C-GAAR, msn UE-207, Transwest Air on March 7, 2018 by Bruce Drum.